From chapter 13 of Life in the ‘Cosm, by lil’ ol’ me. I have no concept of what it means to have a “lovely wine that goes so well with this fish”, or a nice drink in front of the fire while I chat with my best friend. I only drank to get drunk. I only drank to self-medicate. I drank alone. I even hid my drinking by pouring Koolaid into my glass to disguise it. I drank destructively. On November 10, 1989, I told my then boyfriend (my now husband) and my best lady friend that I had a problem and I needed to stop. And miraculously, I did. I’ve never been to a 12-step program, but somehow, organically, I did the 12 steps. However, knowing what I know now, I would recommend going to a support group. It would have been much easier on me if I did. To this day, I always know where I can get to an AA meeting if I need one. It’s so important to get the help you need. Don’t hesitate! In my upcoming book, Life in the ‘Cosm, I playfully write about two characters accidentally getting drunk. I don’t think I could have done that chapter many years ago, because I only saw booze as EVIL!!! But I understand now that there are many people, including my husband, who drink responsibly and sparingly. I can divorce myself from the ugliness of alcohol to write a very silly chapter. Yet, I do show in ‘Cosm what happens if you just gulp down anything that’s in front of you, especially on an alien world. There are always consequences to a lack of good judgment. Virj finds that out in a hurry. Sure, I’m proud to have come this far. 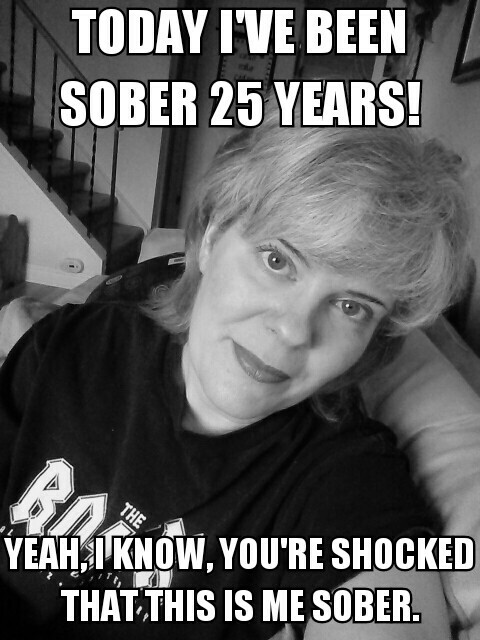 25 years is a long time, but I couldn’t get there without remembering that I do have a problem for life, and every single day I need to make the choice not to drink. I admit, it’s much easier not to drink today, but you’d be surprised how temptation can randomly smack me upside the head. Just months before I hit 20 years sober, I had to flee from a restaurant, because I was overwhelmed by the urge. I was so surprised by the craving, but it did pass. It was a sober reminder that addiction never goes away, pun not intended. To those of you battling addiction, or living with those who are, I salute you. You can come out the other end and live a life of peace. My sincere prayer is that you do. Many blessings upon you!